Sound Very balanced overall, but when it leans its toward a slight darkness; smooth-sounding; terrific bass extension. Features Fully balanced circuitry; moderate 18dB of line-stage gain; solid and easy-to-use remote costs $500, as does optional internal phono stage. Use Runs hot, so allow for ample ventilation; claimed tube life is 5000 hours. Value Tremendous value given its high level of performance and user-friendly features; can live happily with components that are much more expensive than it is. A four-year-old company should be just getting by. It should be recovering from start-up mistakes and moving on to youthful indiscretions. But, no doubt to the chagrin of the competition, Balanced Audio Technology (BAT for short) doesnt fit the pattern. Having jumped completely over infancy, BAT descended upon the high end at CES 95 with Minerva-like, full-grown suddenness. Since that debut, each and every BAT product has looked and sounded fully developed. A significant portion of that mature sound comes from choosing to employ tubes in their first round of products. But rather than shoot solely for an engaging and slightly euphonic tube sound, BAT achieved a truly sophisticated sound by utilizing balanced circuits in every product, hence the corporate moniker. This combination of technical expertise and advanced sound brought them widespread attention right out of the chute. And if their goal was to compete immediately on sonic and visual grounds with the likes of ARC, C-J, and Mark Levinson, they succeeded in doing that faster than any new company should expect. Within the companys first year, the VK-60 amp and VK-5 preamp were being hailed as benchmark products. In fact, in my years in hi-fi I have never seen a company rise to the elite echelon so quickly. For me, the event that drove home the regard for BAT was CES 98. Everywhere I turned while covering the show I encountered BAT products. Two of the best-sounding rooms on my beat, the Meadowlark room with the $2000 Shearwaters speakers, and the German Physiks room with the $10,000 Movie One speaker system, had all-BAT electronics. Walking around the show after I completed my room report, I saw BAT in (subjectively) more rooms than any other electronics firm. Now, of course, Vegas is not the best place to make informed judgments, but when you see so many manufacturers demoing with gear from the same company (and mind you, the sound in rooms with BAT gear was uniformly excellent in spite of show conditions), you know that the people who make a living doing hi-fi believe BAT is on the right path. All of which brings us to the VK-3i preamp, the entry-level tube model in the BAT line. Considering its features, build and parts quality, the VK-3i retails for a shockingly low $1995. Fully balanced, the non-inverting line stage utilizes four 6922 and two 6V6 tubes. Volume control is via stepped attenuators using Vishay resistors. Internal parts quality and layout are superb and include such cool parts as oil-filled signal caps. Case work is beautiful and very solid as well. The face of the unit, to these eyes, is very hi-tech cool. The medium-black fascia has two powder-gray knobs, one for source selection and the other for volume control. Centered between these knobs is the red LED volume readout (which also houses the optional remote eye). Two toggle switches, one mounted to the far right and one to the far left of the fascia, control muting and power -- very clean and very classy looking. The rear is as nicely laid out. 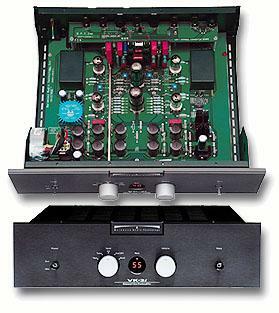 There are three sets of RCA inputs and two sets of balanced inputs. Outputs are single-ended tape, and a set each of single-ended and balanced main-out connections. There is plenty of room, and everything is well labeled. BAT sells high-quality RCA-to-balanced and balanced-to-RCA adapters should you need them to hook up your gear. There are two add-ons for the VK-3i, a $500 solid-state phono stage and a $500 remote-control module. The phono stage is adjustable for 44dB or 58dB of gain, allowing use of just about any cartridge on the market. Default loading is 47k ohms, but this is easily changed by inserting your own resistors. Be aware that if you order up the phono stage you lose one set of RCA inputs. The remote has mute, fade, five user-controlled volume presets, a unity-gain button and volume controls. The unit is carved from a solid piece of aluminum and shares the look and color of the preamp. As a side note, many high-end remote controls (this is more prevalent with CD players) are cheesy plastic wands. There is nothing that will cheapen the "pride of ownership" experience faster than pointing a 50-cent Philips-sourced remote at a $3000 unit. The BAT remote is the antithesis of this. It feels good, looks great and works perfectly. A final comment on usage. The manual says to allow six inches on each side of the preamp for cooling. I agree. The VK-3i ran warmer than most preamps Ive had visit. I put it on a shelf with exactly six inches of top clearance and it still warmed the shelf above. That said, the manual also states that the tubes have a life of 5000 hours, and I believe that as well. Unlike Audible Illusions preamps which eat tubes for breakfast, lunch and dinner (I know after feeding one for the last three years), the tubes in the BAT VK-3i remained stable and quiet for the entire review period. I love it when a manufacturer makes up my story line. After months and months with the VK-3i as my primary preamp I can sum its sound up with one word: balanced. To explain, the VK-3i is detailed but not hyped, smooth but not glassy, dynamic but not boisterous, extended but not etched, natural but not laid-back. Like I said, its balanced. Want details? OK, the baby BAT has a very smooth tonal balance with no single octave or portion of an octave highlighted. Tonal response like this should be mandatory for high-end gear, but few components, especially in this price range, get it so spot-on. As for the extremes, the very highest frequencies are ever so slightly soft, but this is the proverbial error of omission that rarely detracts from the overall performance of a component. The actual effect of this slight rolling is to take just a bit of air away from certain recordings without detracting from the instrumental presentation. For example, the percussion that starts off the first version of Arvo Pärts Fratres on the recent Telarc disc of the same name [Telarc CD-80387] retains all the textural and harmonic information, but it is placed in a slightly less well-defined location than with, for example, my Audible Illusions L-1. The difference was just the smallest increment up from subtle, but more important than the size of the difference was the fact it only had an effect on the highest-level sound of the halls own sound and not on the sound of the instruments themselves. Amplifiers  Warner Imaging VTE-201S, Assemblage ST-40, Blue Circle BC6. Preamplifier  Audible Illusions L-1. Digital  Theta Miles (alone and as transport), Dodson DA-217 Mk II DAC. Analog  VPI HW-19 JR with Rega RB-300 tonearm, Dynavector Karat 17D2 Mk II cartridge. At the other end of the spectrum, the VK-3i reached nearly as deep as anything Ive had here at the Warnke Mountain Lodge and Musical Spa. OK, Im not an organ freak, so deep in this case means the lowest registers of the bass. And in this area the BAT really is as good as any reasonably priced preamp Ive heard. And I dont mean depth alone, for as important as that is, more so is bass definition. A good example of the quality of the bass is the jazzed-out sounds in Joni Mitchells "Harrys House/Centerpiece" from her recent HDCD-remastered CD Misses [Reprise 9 46358-2] (originally on The Hissing of Summer Lawns). The opening bass section establishes the beat and mood of the song, with Max Bennett moving all over the lower end of his instrument. With far too many preamps, especially at this price point, you get either impact or definition. With the VK-3i you get em both. The transition from Jonis tune to the Mandel/Hendricks "Centerpiece" has Bennett moving as low as he can go before setting up a smoothly walking mid-register bass line. The VK-3i gets the deep part right, full of rich overtones and impact, and then, just as a real instrument does, glides seamlessly up the scale to the walking bass line. Theres no loss of dynamics, no accentuating any individual note, just smooth, natural bass. The mids are accurate, natural, full but not overripe, and very, very nuanced. This smooth-and-accurate sound mimics both what I expect to hear when listening to live music and what I want to hear when listening to my stereo. Using Joni as the example again, the album Misses has cuts from 1970 to 1994. Over that quarter century, Jonis voice went from a child-like clarity that was far too innocent-sounding to convincingly convey the meanings of her very adult lyrics, to that of a cigarette-stained chanteuse with all the complexity and depth of a great 30-year-old Bordeaux. The BAT transmits all the sharp overtones of the young Joni without pinning your ears back, while also conveying all the layers of the older, and in my mind, better Joni. Without belaboring the point, this is exactly what a preamp should do. With tubed components, I usually find that they excel at the microdynamic variations that foster the illusion of real music, while the macro swings, often impressive in a showroom, are a weakness. In this area the VK-3i did better than many components, but couldnt entirely shake its thermionic background. The micro swings were superb. Subtle but correct, they made Miles sound very present and alive. They gave Stevie Ray Vaughans guitar breath. And they gave piano body. Only when pushed on macro swings did the BAT give anything up. Once again, this is exactly the type of omission that makes for a good long-term partner. Expression comes from those subtle breaths and pauses, and this is where the VK-3i lives. Those softened CRASH, BOOMS and POWS are important, but far less so than the subtle breath of life itself. Put another way, the old BATman TV show had all those SOCKS, BIFFS and SMACKS, but, lacking subtlety, it was still nothing more than a live-action cartoon. Staging was excellent overall, although not quite up to the level of two of the (far) more expensive preamps Ive had through here lately. The Joule Electra LA-100 Mk III had a wider and deeper stage and the Thor TA-2000 had a more layered presentation. But back on similar-price turf, the BAT VK-3i held its own with the Audible Illusions L-1. The L-1 has more width, but the BAT has a naturalness about its presentation. Images have density and dimensionality. The stage was bit darker than that offered by the L-1, but it also offered a more organic feel, a greater naturalness than that of the L-1. If there is an area where the VK-3i proves itself to be a touch human it would be the clarity of its presentation. Its a scoosh on the dark side, and corners can take on a bit of darkness, while foreground instruments may slightly obscure the rear ranks. The Cowboy Junkies Trinity Sessions disc [Classic RTHCD8568] is recorded live to DAT. The church it is recorded in is a near-equal player in the sound of the disc, and the slight darkening of the VK-3i affects this slightly with the church acoustic being closed in compared to the sound of the disc through either the Joule Electra or Audible Illusions preamps. Other Cowboy Junkie albums rely on dark atmospheres, and the BAT slightly exaggerates this feeling as well. I really dont want to make too big an issue of this, however. I never felt like I had lost something with the VK-3i in the system. It was more that I was listening to tubelike recordings rather than solid-state ones. But, putting the audiogeek details aside for a bit, lets get to the fun part of the VK-3i. It gets to the heart and soul of a recording better than any $2000 component that I know of. Pop in a disc, say the MoFi reissue of John Coltranes Ballads [Mobile Fidelity UDCD 731], and sit back. What happens is re-creation. Coltrane appears and caresses. (Dont believe me? Check it out. Coltrane was the complete package, and MoFis reissue superbly shows this). McCoy Tyner fills and solos with gentleness, while Elvin Jones and Jimmy Garrison (and Reggie Workman) mark time like Gods own watch. Its remarkable. Jazz not your style? OK, try the new gold-disc reissue of the first Van Halen album [DCC GZS-1129], specifically "Eruption." Listen to Alex set it up briefly on drums and then be astounded anew at Eddies power, speed and imagination. Just remember when the songs over that they really werent in the room, so no autographs. Need to go upscale? Try the Bruckner 9th with Stanislaw Skrowaczewski conducting the Minnesota Orchestra [Reference Recordings RR-81CD]. An HDCD recording, this disc has sound thats as good as any Ive heard of a full orchestra. As for the piece, its true that Bruckner knew how to start a symphony but not how to conclude it, which is part of what makes the unfinished 9th so good (maybe they should just leave the last movement off of all his works). Perhaps that is why of all of Bruckners work, I love this one most. I play this so often that my dog hums along. With the BAT VK-3i in the system, I just cant get enough of it. So effortless, so balanced, so disarmingly real, it simply fills me with beauty. As for the $500 phono stage, I tried it with both MM and MC cartridges. The MC cart, a Dynavector 17DII, has a low output of .23mV, which will test the noise floor of any phono stage. The VK-3i was as quiet as any Ive had here, and quieter than the Thor TA-2000, in fact, although that phono section was more liquid and a bit more resolving. The sound of the phono stage was very similar to what Ive described elsewhere. Stonily quiet, it was also smooth all the way to the top. Even if you dont have vinyl today, if you get a VK-3i, unless you need all five inputs, get the phono stage. It is excellent and should give you all the incentive you need to go retro. At $1995 (or, depending on options, $2495 or $2995), the VK-3i faces a lot of competition, with the Audible Illusions twins heading up that group. The L-1 ($1895) and Modulus 3a ($2295) have earned their fame. Well built, with thoughtful if somewhat awkward features (the volume/balance control), they are high-value components of the first rank. My L-1 has seen years of service with only the more-than-occasional need for re-tubing (since I have an L-1 and not the Mod 3a, Ill confine my comments to the line stage only). In comparison to the VK-3i, the L-1 has a lighter presentation, more audiophile but also more intrusive than the slightly dark but very natural BAT. The AI preamp also sounds quicker and coveys an impression of greater clarity and detail. It has greater dynamic impact than the VK-3i, and it throws as wide a stage as Ive been able to get in my room. On the other hand, the BAT has a slightly dark but nonetheless more neutral balance that doesnt favor any part of the spectrum while the L-1 sounds slightly tilted up. It is smoother than the L-1, offering a more relaxed and grainless view into the music. And while the L-1 may sound quicker, the VK-3i is no Left Foot Louie. I never felt a loss in pace with it in; rather, the L-1 seemed to slightly quicken the pace. The BAT also offers a couple of things that the both the L-1 and the Modulus 3a cant -- remote control and balanced topology. Personally, I love the remote. It makes listening and adjusting levels much easier. As for balanced operation, my experience has been that in most cases balanced gets you a bit more resolution and control. The differences can be hard to track down, but if you get the BAT, you should look for balanced partners (good advice in any endeavor) to get the most out of it. Lastly, for the price of an L-1 you can get a line-stage-only VK-3i and then upgrade it the equivalent of a Modulus 3a by adding the phono stage. A visual metaphor to sum up. To me, the L-1 sounds like a monitor that has had the brightness turned up half a notch and the contrast just a bit more. The enhanced contrast and brightness give the appearance of greater detail but also alters the balance between background and foreground, with the emphasis on the later. The VK-3i, in opposition, is like a monitor that has had the contrast set back a half notch. This is closer to the truth, but its still subtly shifted, moved a bit to the background, to the context of musics meaning rather than the details of the music-making. Summing up the facts of the BAT VK-3i, it is a preamp that has a very slightly dark presentation, with superb textural and harmonic abilities. It goes nicely deep and with excellent definition. It breathes naturally, and while it has good punch, it lacks the last little bit of visceral slam. The stage is wide and very deep, but more important, it feels natural and has seamless layering. As for clarity, while on the dark side and short of the very best preamps Ive heard, the VK-3i, due to its natural presentation, never misses information. When I changed amps, I heard the differences. When I changed sources, I heard the new source. When I changed wire, I heard wire changes. Actually, in this area, the VK-31 outperformed the Audible Illusions L-1, which seemed to speak with a slightly audible brightening regardless of partnering equipment. The phono stage is a bargain, and the remote worked perfectly. This preamp is a real find -- a full-featured, remote-controlled preamp for less than three grand, or a line-stage-only preamp for less than two. For a component in this price class, performance at this level and with such an even balance is remarkable. In the months it has sat in my system I never once felt it was holding the rig back. And in case you cant read between the lines, this sweetie stands as my personal sub-$3000 reference, where I expect it to stay for a long, long time. At this price you can get better detail, or a more pleasing, euphonic sound, but there is simply not a more balanced preamp that I know of for anywhere near the VK-3is price. I can see the VK-3i as the control center of true high-end systems where each component costs more than it. In short, the BAT VK-3i is an affordable classic if Ive ever heard one.